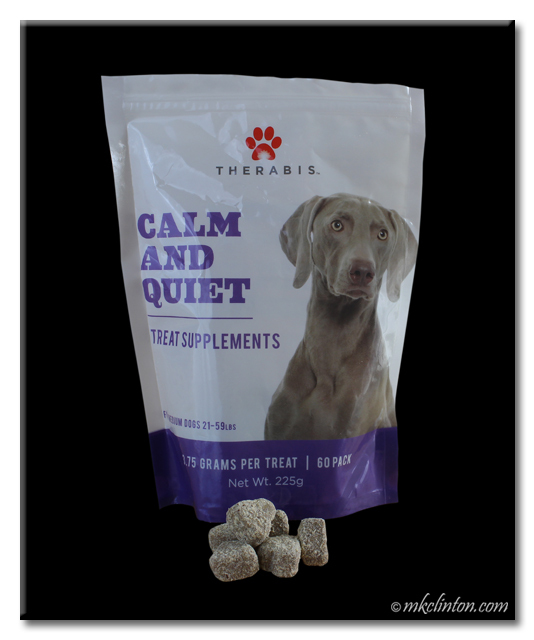 Barking from the Bayou, LLC received a bag of Therabis Calm and Quiet in exchange for an honest review. We only share products that we trust and believe will benefit our readers. All opinions are my own and Therabis is not responsible for the contents of this article. Last month we introduced you to Therabis™ Stop the Itch. The difference in Bentley’s scratching is incredible. He continues to get one sachet added to his breakfast each morning with wonderful results. The review that I wrote was sponsored by Therabis through the BlogPaws® Pet Influencer Network™. I was so happy to find an all-natural product that is controlling his itching that I decided to reach out to Therabis and thank them personally. 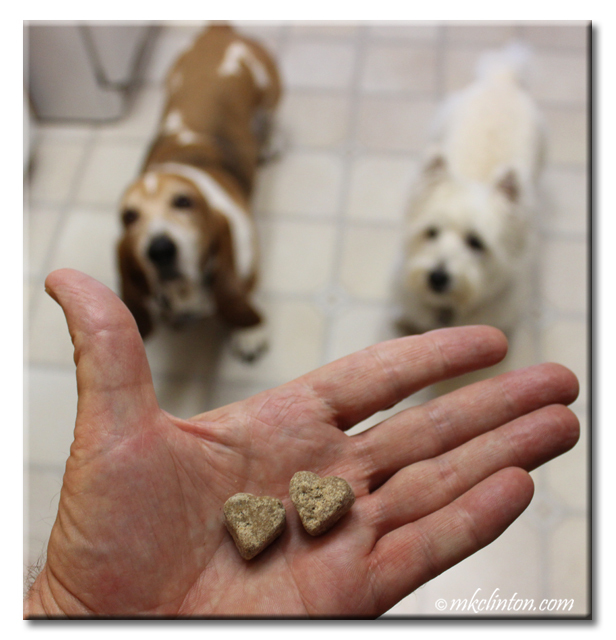 They offered to send me their Calm and Quiet Treat Supplements to see if they helped Bentley during thunderstorms and other stressful situations. Therabis Calm and Quiet offers a powerful veterinarian-developed formula that combines whole-plant cannabinoids from hemp with L-Theanine from green tea which helps dogs maintain their social and emotional best. It is available in the powder sachets or in tasty treats. You choose the formula based on your pet’s weight. Bentley and Pierre love the taste of the new treats. They use the medium size for dogs between 21 and 59 pounds. The key to using Calm and Quiet Treat Supplements is to provide the treats BEFORE the stressful situation presents itself. When the weather forecast calls for thunderstorms, I give Bentley two of the heart-shaped treats about 30 minutes before it is expected to hit. I do the same for both dogs before we have company or go to the vet. It helps them to remain calm in situations that usually have them either nervous or hyped to the max! As I explained in our Stop the Itch post, Cannabidiol (CBD) is a naturally occurring chemical found in hemp. It does not create the psychoactive effect of the THC found in marijuana. That means your pet is not going to experience the high associated with marijuana use. It is time to give CBDs a chance in the way we treat our pets. I am a strong believer that the less chemicals we introduce into our pets, the better they will be and the longer they will be with us. Cannabidiol is one of the most exciting therapies used for treating our pets naturally and I say it is about time! Hi Mark: We just announced a special discount for Barking on the Bayou fans. Enter "Bayou" at checkout to receive 20% off a one-time purchase (not valid with other discounts, limit 1 per customer). We hope to see you at Therabis.com! This might keep you out of the chair of shame! LOL! We are so thankful to discover the awesomeness of Therabis! Around here we are in need of get going tablets. My sisters do have their wild moments, but as a rule, all three of us are so mellow it is almost too much Mom says. I'm sure these work well for the more nervous type dogs. We are very happy with them for both of the boys. Mom says that we will have to look into giving these a try. Fireworks and thunderstorms stress me out and these sound wonderful! Great review, guys! Hi Molly: We just announced a special discount for Barking on the Bayou fans. Enter "Bayou" at checkout to receive 20% off a one-time purchase (not valid with other discounts, limit 1 per customer). We hope to see you at Therabis.com! I love treats mom will have to investigate something similar for kitty kats. Mom says they might calm me if I get them just before my subqs. You see I don't feel the subqs but I have to be kind confined and and held still (mini choke hold by mom) which I don't like. That would be great. I believe they are working on something for cats. I need to give these a try for Rudy. Thanks for the review. We just announced a special discount for Barking on the Bayou fans. Enter "Bayou" at checkout to receive 20% off a one-time purchase (not valid with other discounts, limit 1 per customer). We hope to see you at Therabis.com! Let me know how they work for Rudy! I love Therabis for Bentley & Pierre. Gambler would like the calming part of those treats. We have tried a different brand of CBD treats but I have really not seen much difference in Luke's nervousness. I wonder if there is a difference in brands, if these would be worth trying, or if he just does not respond to the CBD like some dogs do. I find that since Therabis is designed for certain problems that it works really well. You can try to Calm and Quiet and save 20% one time (1 per customer) with my code Bayou. They just sent it to me and I am so happy to offer it to everyone. We cannot sing the praises of CBD products enough since I started given them to my crew. They help with Elsa's seizures and Sam's anxiety riding in the car on long trips. Less chemicals is definitely better for our fur-kids! I am glad that you are also on the CBD bandwagon! I did receive a discount code for Therabis! Enter "Bayou" at checkout to receive 20% off a one-time purchase (not valid with other discounts, limit 1 per customer). Oooooo we hope you get lots of storm forecasts, so you can have more treats. We don't hope the storms eventuate, just forecasts. Thanks! We get them when we have company too so many friends will stop by to see us! Do they make these for cats? They definitely could be needed here. I am checking with Therabis to know for sure. Thanks for asking. I heard back from the company today. Therabis is not currently made for cats but stay tuned for an upcoming announcement here on or on their social media! Raven and Linus are not so fond of the fireworks. Luckily we have very few thunderstorms out here. My brother's dog, Georgie is about 100x worse than my dogs. I think the Calm and Quiet would definitely benefit his family. I'll share this information with him and his wife. Next firework season I'll definitely look into Therabis products. Thanks for sharing! Thank you so much! I love it for my two boys. Give your brother my new discount code. Enter "Bayou" at checkout to receive 20% off a one-time purchase (not valid with other discounts, limit 1 per customer). So it won't make me laff at things dat aren't funny?? BOL! Well, you're a Westie so you'd probably still laugh! BOL! This sounds really interesting. Mabel has her moments (when company comes over) and sometimes riding in the car. I wonder if it would help with anxiety at the obedience trials? So far anything we have tried has not helped. I am definitely giving them to the boys before our next car ride. They gave me a discount code that you can use to try them. Enter "Bayou" at checkout to receive 20% off a one-time purchase (not valid with other discounts, limit 1 per customer). We took advantage of the discount and ordered last night! We have a Cable technician coming today and I wish I already had some on hand to try. Yay! Let me know how it works on your girls. I had the opportunity to do a review of the Calm and Quiet treats as well, and I was amazed at the results! They've helped Icy SO much with her fear of our walks into town and thunder.